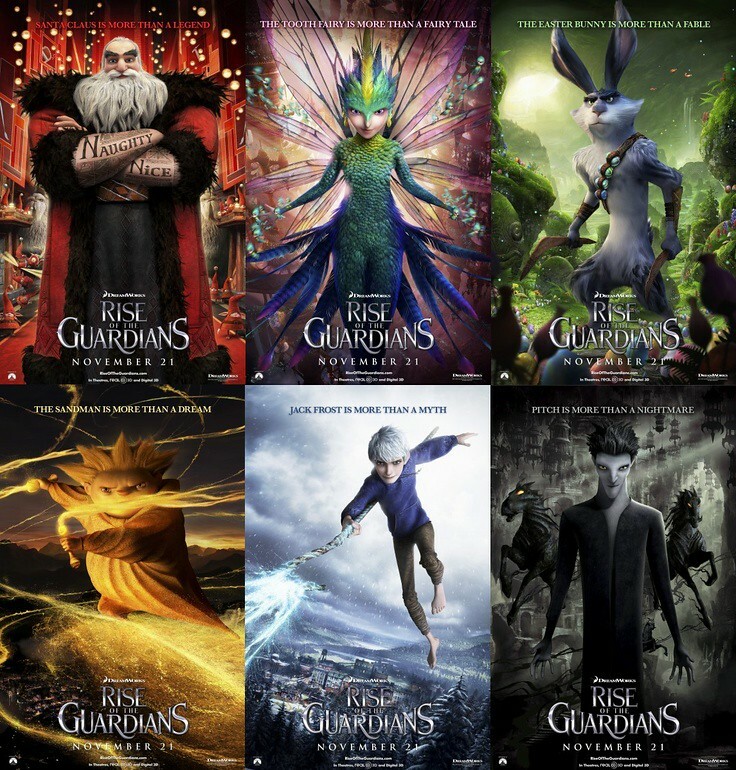 Generation after generation, immortal Guardians like Santa Claus (Alec Baldwin), the Easter Bunny (Hugh Jackman) and the Tooth Fairy (Isla Fisher) protect the world’s children from darkness and despair. However, an evil boogeyman named Pitch Black (Jude Law) schemes to overthrow the Guardians by obliterating children’s belief in them. It falls to a winter sprite named Jack Frost (Chris Pine) to thwart Pitch’s plans and save the Guardians from destruction. I’ve watched Rise of the Guardians back in 2012, but I decided to watch it again. It’s always nice to see a Christmas film. Although I don’t really celebrate Christmas, I like the hype during the Christmas season, including films that took Christmas theme such as Rise of the Guardians. Now, Rise of the Guardians is one of the best animation films, in my opinion. The story is simple yet somehow can teach so many lessons to children. I know I am not a child anymore, but still, I think this film is very good for children. Taking Christmas as a theme, the film teaches children to have dreams and beliefs. I know Santa Claus is not real or Easter Bunny or Sandman, or maybe they are real, I don’t know. But, I think it’s alright to make children believe in them. It’s good for them anyway. We’re not lying but more like teaching them some lessons about the purity of Christmas and things that we can learn from Christmas. Jack Frost: When was the last time you guys actually hung out with kids? North: We are very busy bringing joy to children. We don’t have time… for children. I like the Easter Bunny, especially when he’s in his cute forms. He’s super adorable! Although I don’t know I like the way he travelled everywhere. I think in a matter of travel and fun, I will choose Jack Frost. Not to mention he’s the most handsome one. Duh? Anyway, I also like Sandman. He’s very cute! Seriously. Despite not talking at all, his facial expression and his behaviour are already funny enough to make us laugh. Anyway, let’s get back to the story. The main story is about saving children’s belief in Santa Claus, Tooth Fairy, Easter Bunny, and Sandman who gives sweet dreams for children. Everybody is afraid of Pitch Black because he will give nightmares and he wants to make all children no longer believe in Santa Claus, Tooth Fairy, Easter Bunny, and Sandman anymore. In a time like this, they must take Jack Frost as the newest Guardians to help them. No one actually believe in Jack Frost, so no one can actually see him. But he’s the only one who knows what fun is all about. Even though the others are expected to cheer and entertain the children, but it’s Jack Frost who knows how to have fun. However, it’s not a simple task to make someone a Guardian, because they have to make sure all children are protected from darkness and despair. It’s not just about fun anymore. In the film, we can see how Jack Frost learned to find himself. Why he was chosen to be a Guardian and why he fit the role. Jack Frost himself is voiced by Chris Pine. I really found the voice pretty familiar when I watched the film. I kept guessing but somehow couldn’t find the right actor. Only later on when I looked it up on the internet that I knew who has voiced Jack Frost. I don’t really know how a good voice actor is but I assume he must be able to give the character a soul. His voice must represent the mood the character is in, whether the character is sad, angry, happy, or even feeling so so. Chris Pine really did voice the character perfectly. He really sounded like he’s having fun. The other actors and actresses also have done a great job in voicing their characters. I like how Hugh Jackman who voiced the Easter Bunny can still use his original Australian accent. I don’t hear Hugh Jackman’s real accent very often since he mostly played the character of an American. He’s doing a great job in mastering the American accent because he really did sound like a real American. So that’s why it’s good to hear him speaking in his original accent. Hugh Jackman has done a great job in voicing the characters. He made Easter Bunny a bit sarcastic but also at the same time, funny as well. Of course, an animation film is about the animation. I think animation films have now far gone from the animation films a few years back. The drawings are getting better. They become more beautiful and therefore made the films more enjoyable to see. Of course, to make a good film is to have a good story, but for animation films, the animation itself is the important part because after all, we’re seeing the animation first then the story. In the end, we see a film as the whole package, a good story and a good animation. So it’s hard to choose whether I will prefer a good story than a good animation or vice versa because both of the elements complement each other. Jack Frost: We’ll always be there, Jamie. And now, we’ll always be here. Anyway, Rise of the Guardians has indeed a very good story, there’s no doubting there. As I have mentioned it before, the film has taught so much, especially to the children. Not to just believe in Santa Claus or Tooth Fairy or Easter Bunny, but the important thing is not to be afraid of the Boogeyman. Everyone must have something that we are scared of but we must not let those scary things stop us from doing things or believing what we believe. Rise of the Guardians also has taught the children to always have fun, be happy, and not to be afraid of anything. And of course, the film also has taught about teamwork and self-discovery. Jack Frost has taught that everyone always has a purpose and we have to look deep inside our heart of what who we really are and what’s our purpose. I guess those lessons were delivered very well in Rise of the Guardians. Like every other animation films, Rise of the Guardians also has some comedy in it. The film made sure that the audience got some laughs. The lines are funny, even the expression of the characters are so good and so funny that I’m sure you will laugh. Some parts even very touching it will give you some chills. Since this film is rated PG, the action sequences are not too violent. In fact, it’s not even violent at all. After all, the children only tried to overcome their fear not joining in some gruesome feast fights or some sorts. I also like the way Jack Foster had fun with the children because only watching him, I can already feel the excitement. 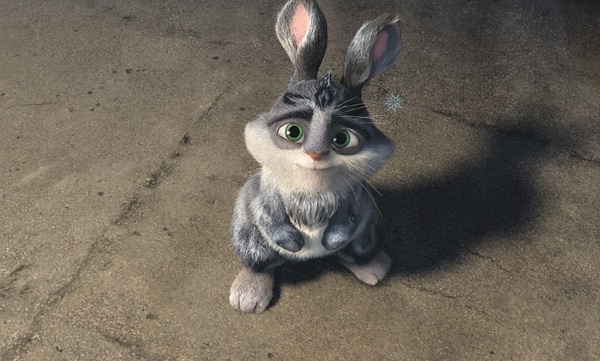 Bunnymund: Whoa, whoa, whoa! Where are the bloody seatbelts? North: Ha! That was just expression! All in all, Rise of the Guardians is a very entertaining film. 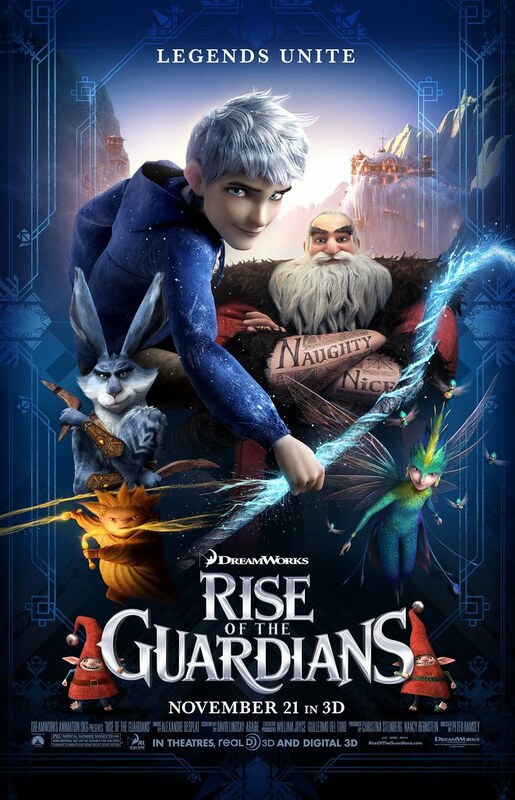 With many moral lessons that can be learnt from the film, Rise of the Guardians is very suitable for children and even for the adults too. Not just the lessons, the whole story is great and even the actors and the actresses have voiced the characters really well. The production team has done a great job in creating a beautiful animation such as this film. I really like this film and really enjoy it. The film made me laugh and even gave me chills at some points. I’m surprised it’s not being nominated for Academy Awards but being nominated for Golden Globe is already an achievement itself. In any rate, I think Rise of the Guardians is really a good animated feature film. I really like it and very much enjoy watching it. I give Rise of the Guardians 8 out of 10 stars.